The EC football team kicked off it’s week one game preparation by participating in two preseason traditions on Monday, August 22. 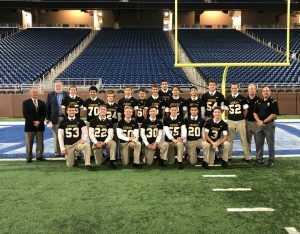 The Mountaineers joined the Catholic High School League at Ford Field for the 3rd Annual Rosary Rally at Ford Field. Coach Michael Pruchnicki and senior Josh Legg provided testimonies following the rosary. Later in the day, the players joined their dads for Father-Son Jersey Night, where they were presented their game jersey. This team tradition began with the inaugural EC football team in 2013 and continues to be a memorable night for all. 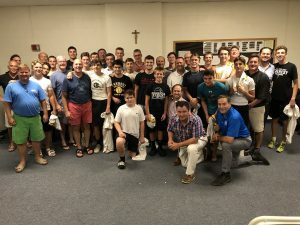 The night was particularly moving for the seniors and their fathers who participated for the final time. The Mountaineers continue their preparation for the season opener on Friday, August 24 against Oakland Christian.